Just Toys Classic Cars is proud to present the best custom, classic, antique, exotic, and muscle cars. 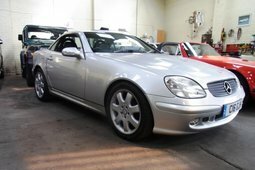 Right here is a beautiful 2003 Mercedes Benz SL55 AMG. Obviously, this car is all original and the paint shines miles deep. The chrome 19 wheels look fantastic on it and this one is completely loaded. When this car was new in 2003 it stickered for $124,645, but you won't pay anything near that price today. When you slide in to the amazingly comfortable AMG Charcoal leather interior you know what comfort is supposed to feel like. These seats just fit you like a glove and the massage feature will keep you very comfortable on those long road trips. Obviously, there are no rips, tears, or cracks anywhere. This car looks like it is brand new because it practically is brand new. The hard top convertible works just like it should and has the optional panorama roof with sunshade. So you can let plenty of light in if you don't want to drop the top. Under the hood of this beauty is the beast. Between the frame rails sits a 5.5 Liter Twin Spark 24 Valve Aluminum intercooled V8 Kompressor. All of that equates to a 493 HP V8 with 516 lb ft of torque that is going to put that ear to ear grin on your face and do it with all the comfort and luxury that Mercedes can provide. That power is mated to a 5 speed automatic with AMG speed shift technology. Then all of that power goes out through an independent 5 arm multi link suspension. This car hauls the mail and takes turns like it's on rails all at the same time. Power disc brakes all the way around take all that go and bring it to a whoa very quickly. This car is absolutely loaded and needs to be in your garage today.